Today we saw a comment on Facebook saying that Guinea Pigs are small creatures that can’t be blamed for mischiefs, like a rabbit for example. So, I’ve decided to tell you some stories about me and how “nice” I behave towards my humans. Next, the printer used to be on the floor and the paper tray was opened at the back. At some point the hm prints a boarding pass and is astonished by the nice bordure that the paper has on one end. Then he realizes it was me again who did that nice pattern. But the most crazy thing I used to do was claiming my couch. So, the humans have a couch that can be split in two. One particular side of it was always close to my room and I always had the opportunity to get out and take a walk on it. So I’ve kinda got used with the fact that it was mine. Just the hf got to sit on it and I was used seeing her there when at home. Last summer she left for one week and the hm moved on that side of the couch because it was more comfortable to watch the football games. I’d got so upset that I used to go out and shout at him. I gave up only when he moved back on his side of the couch. Although I share my life with Data now and I spend less time on the couch, I still claim it as mine. If we have guests that occupy it for more than few nights, I get out and spy on them hopping that my red eyes will scare them and make them leave. The secret to get clear with all this is to look as innocent as possible. 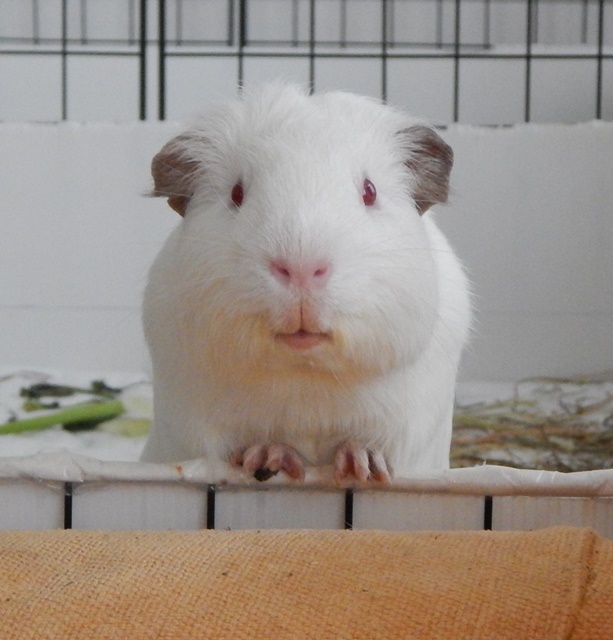 So, whenever someone says a guinea pig is a boring creature, just refer them to this page.